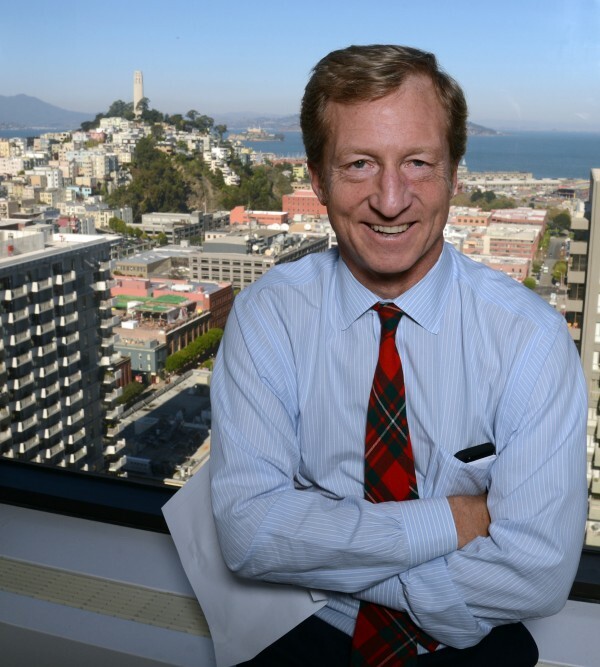 Hedge-fund billionaire Tom Steyer poses for portrait as he talks about the future of California politics at his office in San Francisco, November 12, 2012. WASHINGTON — Billionaire environmentalist Tom Steyer plans to finance full-fledged political campaigns in at least seven states key to Democratic fortunes in the 2014 midterms and the 2016 presidential race, further cementing his rapid rise as one of the party’s most influential patrons. So far, the list of targeted Republicans includes Senate hopefuls Cory Gardner in Colorado, Terri Lynn Land in Michigan and Scott Brown in New Hampshire, as well as governors Rick Scott of Florida, Paul LePage of Maine and Tom Corbett of Pennsylvania. The group also plans to target the GOP’s Senate nominee in Iowa. The effort will be largely financed by Steyer, a former hedge fund manager who has pledged to spend at least $50 million of his money on this year’s races. The super PAC is also seeking to raise an additional $50 million from like-minded donors. With the promise of ample resources, the group plans to spend money not only on television ads, but on data-driven voter outreach and opposition research, “every aspect of a modern-day campaign,” said Chris Lehane, Steyer’s lead political strategist. “Tom has made clear that NextGen is not a drive-by” super PAC, Lehane told reporters at a briefing in Washington. Steyer, whose super PAC spent more than $8 million last year on the Virginia gubernatorial contest and Massachusetts special Senate election, could both help and hinder Democrats. After indicating this year that NextGen Climate might target Democrats who support the Keystone XL pipeline, Steyer’s group outlined a plan Wednesday that avoids such intraparty fighting. Steyer recently gave $5 million to the Senate Majority Fund, the super PAC backing Senate Democrats. And he is set to host a Democratic National Committee fundraiser featuring Vice President Joe Biden at his San Francisco home. this month. But his political spending could create awkward situations for Democrats. In Colorado, for example, Lehane said the group might focus on natural gas fracking, an issue that could put Democratic Sen. Mark Udall, who has expressed support for the industry, in an uncomfortable bind. And Steyer could become a flashpoint in this year’s midterms. His expansive spending comes as Senate Majority Leader Harry Reid of Nevada and other Democrats are railing about the influence of conservative donors Charles and David Koch, opening the party to charges of hypocrisy. Lehane said Wednesday that Steyer has divested his investments from coal and tar sands. He said he did not know whether Steyer was invested in other energy industries such as oil and natural gas. But he said Steyer does not stand to benefit personally from his political spending and thas committed to giving away the majority of his fortune. A NextGen Climate spokesman said Steyer has investments in green energy held by foundations and trusts. and that any profits are donated. to charitable organizations. In his political spending this year, Steyer appears to be testing new ways to leverage climate change in local races. Lehane said the group is drawing lessons from other movements that have pushed for social change. “Change occurred once those issues were defined in moral terms, as right versus wrong, and then used within our political system as a wedge issue,” he said. Washington Post staffers Alice Crites and Carol D. Leonnig contributed to this report.